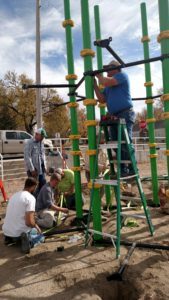 Completed almost entirely with labor from nearly 30 parents and community members, old, unsafe playground equipment was removed and replaced with brand-ne w and much appreciated equipment at a NW Kansas elementary school. Volunteers put up the new playground over a two-day period. Others supported the project by providing food and beverages for those working on the build. School staff members (superintendent, PE teachers, and principals) also assisted after hours. A grant from the Hansen Foundation helped in the purchase of the equipment.